*First Author, professor, Department of Medical IT & Marketing, Eulji University, Korea. Tel: +82-10-7288-7160. E-mail: ymkwon@eulji.ac.kr. 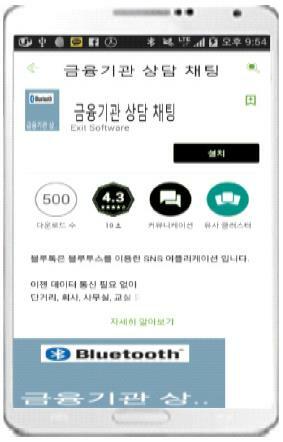 **Author, Department of Medical IT & Marketing, Eulji University, Korea. 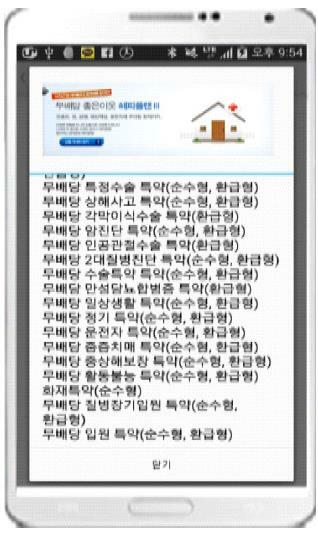 ***Author, Department of Medical IT & Marketing, Eulji University, Korea. ****Corresponding Author, professor, Department of Medical IT & Marketing, Eulji University, Korea. Tel:+82-10-5055-3696. E-mail: binsum@eulji.ac.kr. Received October 18, 2014. Review December 09, 2014. Accepted December 15, 2014. Purpose - This thesis aims to propose a method to help financial institutions improve their customers’ convenience online and offline through a Bluetooth based App using the tool of a beacon. The emergence of smartphones in the 21st century and their increasing use makes it possible to search for information easily. 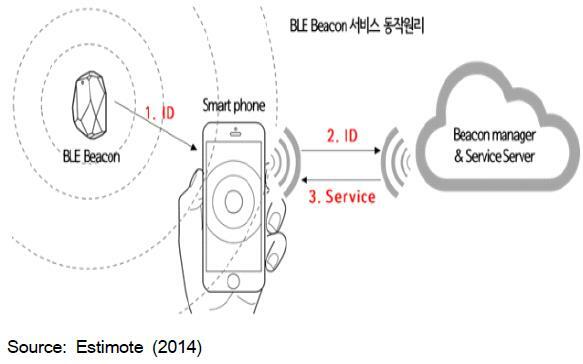 Research design, data, and methodology – With the short-distance Bluetooth technology for smartphones, which finds users within a radius of 50m to provide the functions of message transmission and mobile payment, users can access information services and use mobile coupons in certain premises. Thus, beacon-based O2O technology has been developed. Results – This study offers a method of attracting customers through an O2O marketing strategy that overcomes the existing limitations of Web and Offline media. Conclusions –Since beacon technology has the advantage of more accurate positioning than GPS, financial institutions provide their product information for users through the basic function of a beacon, using an O2O (Online to Offline) marketing solution and, therefore, effectively enable customers to make relevant payments online and conduct their financial actions offline. Key Words : O2O, App, Financial Institution. In various areas (including construction, medical service, communications, and airlines) of the current ubiquitous society, the things which communication function is built in are used widely. As a result, the services meeting customers’ specific needs are provided at any times and any places without users’recognition. In the circumstances, the competition of smartphone performance and the improvement and expansion of communication network technology resulted in offering various kinds of services and convenience to users through smartphones. In Korea, the smartphone market scale is on the remarkable increase. With the growth of the smartphone market, it is expected that more research on the use of smartphones will be conducted actively. According the report of Nielson, a global research company, smartphone penetration rates according to specific conditions are presented as shown in the below table. According to Swirl’s questionnaire survey with 1,000 smartphone users, their ad use rates are shown as presented in the below table. As such, most smart phone users enjoy various kinds of benefits offline, and commercial ads based on smartphones are also on the rise. Recently, research on the services using Global Positioning System (GPS) built in smartphones is actively being conducted. In fact, the current positioning system provides simple services focusing on users’current position and path. Therefore, it has the limitations in the perspective of the information service that is provided in a generalized frame. This thesis introduces a method as to how financial institutions provide information service and other convenience services for their customers with the use of beacons that have Bluetooth built in to solve the problem of GPS function, suggests relevant policies and cases, and proposes the methods of approaching and attracting customers through O2O marketing. 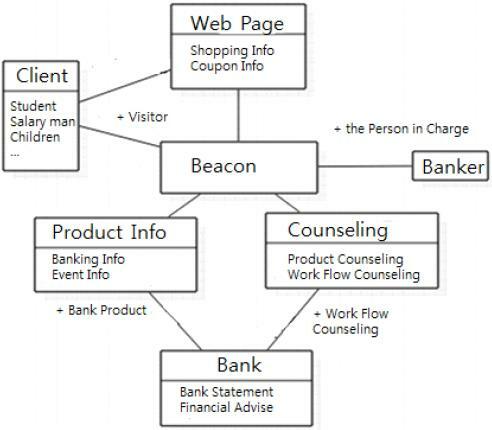 An App using beacon gives is able to offer financial institutions’ product information or financial information to customers’ smartphones; to analyze an event through beacon when the event (e.g., consulting, reservation) occurs in a customer’s smartphone; to print out the analyzed data and relevant information to an offline window and an online screen. Like this, through beacon, it is possible to achieve fast and convenient communication. Aside from that, while customers are waiting in a store, the App using beacon can give the information on coupons issued by nearby retailer or service stores, or market information to customers to activate O2O marketing. The chapter 2 of this thesis explains theexisting information and application of beacon in related works; more details about information and application of beacon and application cases; the concept of O2O marketing and recent O2O marketing cases. Chapter 3 describes the actual experiment of beacon in a small-sized financial institution, suggests O2O marketing strategy for more activation and new market creation, and shows a survey on user satisfaction on the basis of the experiment results. Chapter 4 presents the conclusion of this study. In the era of Queen Elizabeth I of England, a beacon was famously used as a tool to warn of the approaching Spanish Invincible Armada. The Great Wall of China is also a sort of a beacon network. In Finland, these beacons were called ’vainovalkeat’ meaning persecution fires. At that time, many high hills were named after ‘Beacon Hill’after such beacons. After that, the current term ‘Beacon’ is used (John, 2014). Generally, a beacon is a conspicuous device designed to attract attention at a specific location. When a beacon is combined with a device sending specific signals, it becomes a sort of indicator. Based on such a technology, beacons are applied to various areas in diverse ways. In combination with Information Technology, the concept of a beacon has been expanded further. A beacon in a wireless network is a message sent by an access point (AP) or a Wi-Fi router saying that a specific system is running now, and the process of solving a network’s problem on its own is called beaconing. A beacon receives specific information, and sends a specific message or runs other kinds of work when a device capable of receiving the signal, like smartphone, passes by in a relevant region (John, 2014). Beacons for smartphones support simple functions, such as checking a distance and a position, and pushing a message, and can be used in various ways. Beacon technology makes it possible for low-power Bluetooth devices to transmit signals in a limited range. Such a signal can be transmitted up to 50m from an installation position of a beacon (John, 2014). Therefore, stores recently use beacons to analyze customers’ behavior patterns. They put sensors for receiving beacon signals in ceilings, and when customers carry shopping carts or baskets with beacons in their stores, the sensors in ceilings receive the beacon signals. The local data (about where customers stay) are sent to a cloud server for the data analysis (ZachMiners, 2014). Based on the data, various kinds of information, including which products consumers looked at and how long they stayed to look at products, are collected and used as marketing data. Hotels provide customized services by using beacons. For instance, when a customer checks in, a hotel employee is able to know the customer’s id, name, and room number, and a hotel manager is also able to know where each customer is (e.g., lobby, shopping area). Such collected information is used to manage customers and provide customized services. In exhibitions, beacons can be used to give visitors empirical opportunities from the perspective of their viewing with eyes. Through the beacons installed into the entrances or hallways of exhibitions, visitors can get detailed explanations about works, obtain their past information, and listen to relevant sounds with their smartphones or tablets, and thereby can understand works more deeply. 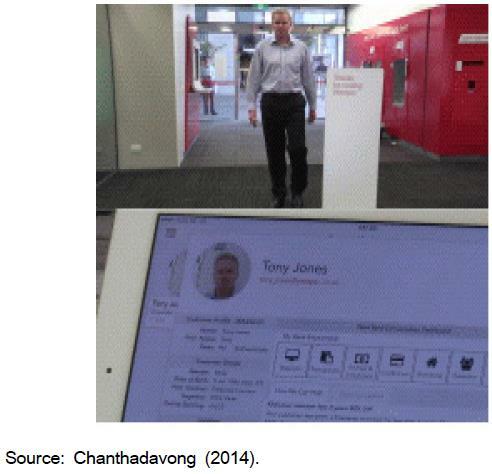 The bank examples of beacon application, surveyed in this thesis, are Westpac Bank (New Zealand) and St. George Bank(Australia). In the case of Westpac, when a customer enters into the bank, bank employees can look at the customer’s data and what the customers want to talk about by using their tablets. Such a case is displayed in <Figure 2>. In the case of St. George Bank, the bank uses all beacons installed into various facilities and shops on the St. George premises to provide services. However, to obtain information, users need to install App inconveniently. As a result, to apply O2O e-commerce to both online and offline customers, it is required to pay attention on customers’ security and reliability Jin (Zhang, 2014 Belanger et al., 2002). Since applying beacons to marketing activities can lead into an increase in customer loyalty, beacons can be used in more diversified ways. In 1999, Teruyasu Murakami, a member of board of directors of Nomura Research Institute, Japan, in 1999, who advocated the term O2O (Offline to Online), categorized ubiquitous network into P2P (Person To Person), P2O(Person To Object), and O2O(Object To Object), and predicted that the true ubiquitous computing era would finally emerge in the O2O stage (Go, 2014). With the development of e-commerce in the internet, businesses online and Offline came to close to each other greatly, and consequently O2O marketing model, a new type of e-commerce, became famous(Zhang, 2014). The key to O2O marketing is to find online consumers and offer services and products to them in actual stores. By moving the conventional e-commerce platform to offline environments and combining two online and offline technologies, O2O marketing is capable of attracting more firms and providing more quality products and services for customers (Chen, 2014 Enfodesk, 2012). Launched in December 2012, LINE@ makes it possible to have friendship between local stores and LINE@ users and let businesses in friendship send coupon discount information and new product information. 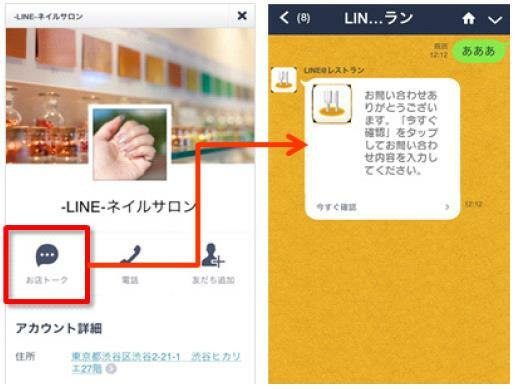 As of now, 30,000 businesses use LINE@ across Japan. In addition, real-time 1 to 1 counseling like LINE@ service, and shop booking through Kakao Talk contributed to activating two-way communication with customers (Back, 2014). Thanks to the aforementioned big potential, O2O marketing for tourism, real estates, tickets, foods, and rent-a-car penetrate people’s living areas especially in the mobile internet, and has shown great development in China (Chen, 2014). O2O marketing activation led into global companies’investments, and as a result, through information, service, discounting and O2O platform, messages are sent online to help customers enjoy products and services offline (Chen, 2014 Enfodesk, 2012). It is predicted that the Chinese internet population will reach 221 million people by 2015. The number of people who searched for stores or booked online increased 58.1% from 2013. Such a trend is expected to keep going on. Alibaba and Tengxun, China’s largest companies, jumped into O2O market with their own messenger and payment system and put their efforts to dominate the O2O market in advance (TMO Group, 2014). According to the June Statistics in 2013, the number of mobile phone users exceeded 460 million, higher than the number of computer users. Given that, the use of mobile devices will play a critical role in O2O marketing, and help to establish a gigantic e-commerce network of O2O marketing. Therefore, e-commerce companies will be able to get a chance to find a new blue ocean in the red ocean. For the reason, O2O marketing will grow greatly in China (Du & Tang, 2014). This thesis proposes a method of activating beacon based O2O marketing in financial institutions. The conventional beacons which are used to affect product sales and attract customers are applied to various areas, but have yet to be used much in the financial circle. To obtain accurate research results, this study conducted an experiment of beacons in a small-sized financial institute. To suggest a more activated marketing plan to beacons, this researcher met an employee in the financial institution and collected their requirements that aim to increase the number of young visitors. To meet the requirements, this study tried to establish an O2O marketing strategy based on beacons. This study developed a smartphone App to recognize a beacon and tried to O2O marketing which serves the functions of providing the institution’s event or financial products for customers near the institution; of giving consulting service to customers waiting inside by employees in bank windows or in consulting service room; of sharing coupon events of stores near the financial institution, information about new stores between the bank and customers, or between customers; of providing the financial information customers are not aware of. Out of 117 survey participants, 69 were male and 48 female. Regarding the number of visits to the financial institution in a month, the answer ‘hardly visited’ accounted for 53% (61 persons). With regard to the number of visits to a market, the answer ‘hardly visited’ made up 40% (46 persons); the answer ’more than once every 2 to 3 weeks’ accounted for 33% (38 persons), and 31%(36 persons), respectively ; the answer ‘more than once every week’ amounted to 15%(17 persons), and 28%(24 persons), respectively. According to the survey, it was found that discount coupons through the App would attract more customers to the offline store. Also, given that in terms of the question about a waiting time, the answer ‘5 to 10 minutes’ accounted for 60 persons (52%), App based consulting would attract more customers to the offline store. For the beacon based App for the financial institution, their requirements were collected from an employee in the institution. Based on them, this study established an O2O marketing strategy to attract young customers. More specifically, the O2O marketing serves the functions of providing new financial information or financial products that customers are not aware of, and of offering consultation and information on nearby stores to them. <Figure 5> Main Screen, illustrates the screen when the application starts to run. 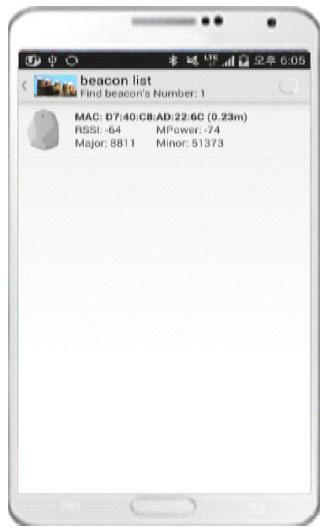 The screen consists of ‘Financial Information’, ‘Beacon Setting (User)’, "Nearby Stores’, and ‘Chat for Consultation’. 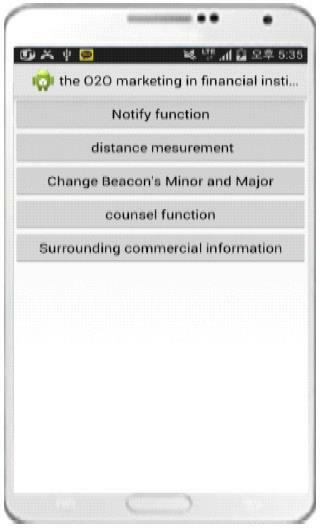 <Figure 6> Beacon List, shows the beacon catching Bluetooth signals when 'Financial Information', 'Beacon Setting (User)', "Nearby Stores', or 'Chat for Consultation' is chosen. When the beacon is selected, the item chosen is executed. As shown in <Figure 7>, when the beacon containing financial information is chosen within a range available for beacon signals, customers waiting their turn can check the details about financial information provided by an employee. As illustrated in <Figure 8>, the information about nearby stores and businesses interacts with the web page. 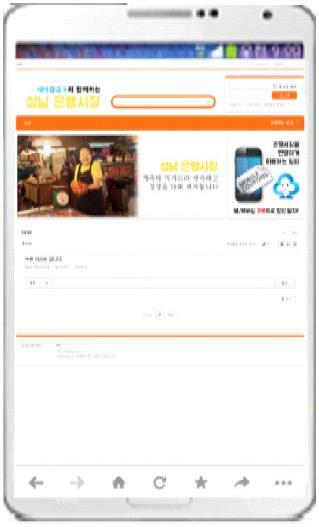 Merchants visiting the financial institution post messages through the App, which can be read by other customer, and thus coupon in formation and store information are provided to them. <Figure 9> presents the function of popping up events of the financial institution. When a customer is in a range of the beacon, the financial event as shown in the above figure is first provided to the customer. <Figure 10> When a user first pushes ‘Chat for Consultation’and then presses the beacon from Beacon List, the user is able to download the financial institution’s Chat for Consultation’App (directly developed by this researcher). The App serves the function of enabling consultants in the institution giving online consultation to customers waiting their turn. The function helps workers, students, and other customers in a hurry to save their time. In this thesis, the researcher studied an O2O marketing activation plan for financial institutions with the application of beacons. With the expansion of beacon application, numerous stores and many firms are using beacon technology. The beacon technology now provides basic services of information and coupons for customers, but is expected to expand to payment system. What needs to pay attention on in terms of beacon based services is that although big companies, such as Line@, Kakao, Yellow Page, and Alibaba and Tengxun of China, started to perform O2O marketing, as shown in this thesis, small-sized stores can use beacons as their marketing strategy. This study actually applied beacon-based O2O marketing to a small-sized financial institution in Korea, and conducted a questionnaire survey with visitors to the institution to investigate customer satisfaction. According to the survey, the value of their satisfaction with store use was higher than the previous one. Therefore, it is considered that it will be necessary to conduct and develop more research on the application of O2O marketing to financial institutions in a different way from the one applied to conventional small stores. Belanger, F., Hiller, J., & Smith, W. (2002). Trustworthiness in electronic commerce: the role of privacy, Security, and site attributes. Journal of Strategic Information Systems, 11, 245-270. Chen, Yijun (2014). The Study of New Opportunity and Potential Risks in the Mode of O2O E-commerce. Bangkok, Thailand:Master of Business Administration in Management, School of Management Shinawatra University. Du, Yingsheng, and Tang, Youchun (2014). Study on the Development of O2O E-commerce Platform of China from the Perspective of Offline Service Quality. International Journal of Business and Social Science, 5(4), 308-312. Go, Jaepil (2014). O2O & Beacon. TECH & beyond, 16(8), 172-183. Zhang, Jin (2014). Customer' Loyalty Forming Mechanism of O2O E-Commerce. International Journal of Business and Social Science, 5(1), 164-169.